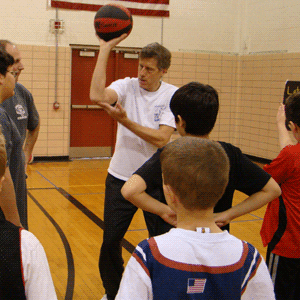 As a youth coach in participation-based programs, I often struggle to teach everything within a short season. Individual and team skills, game strategy, and tactics are all part of a well-rounded learning experience in youth sports. It can be a challenge getting all of this information across to the entire team when the opportunity to practice and play is limited. Sometimes I find myself placing too much emphasis on team and situational play. With the abilities that each player brings to the team, this is often the easiest path to chalking up victories. Set plays, passing, zone defenses are examples of this type of instruction. It’s easy for a youth coach to fall into this coaching pattern. Team-oriented instruction is of course essential to the success of any athlete playing team sports. But the foundation of excellent sports play begins with the individual sports skills particular to each sport. Throwing and catching a ball, shooting a ball or puck, ball handling, defending an opponent one-on-one are all examples of key individual sports skills. When coupled with basic physical traits (size, strength, endurance) and related physical skills such as running and jumping, a young boy or girl possesses the necessary tools to progress and achieve success in sports. And that’s the real goal—enabling each child to reach his or her athletic potential, and to do so in a way that protects the joy of playing. As a parent of a child who plays and enjoys organized sports, you need to pay attention to this aspect of your child’s education in sports. When your child is young, try to place the child in programs that emphasize the teaching of basic sports skills. Look for the right coaches—the ones who are there for the teaching and have a well-balanced, informed view of how to develop each child’s potential. Make sure that your child’s coach is not focused simply on team tactics and winning games. If you've played sports, spend time with your son or daughter and teach them essential skills like throwing and catching a ball. Participate by “playing catch” with your kids and making this a regular part of your interaction. Possibly add these games to your after-dinner family routine. Whenever possible, promote to your child the idea of playing in pickup games. It’s this desire to play with friends that will often lead to even more self-directed play. And that means more practice and repetitions of key sports skills. You can also place your child in local clinics that teach young kids basic sports skills. Often, your local high school, college, or other community organization will sponsor these clinics. Whether it’s basketball, baseball, tennis, or another sport, these clinics are usually inexpensive. For those of you who have more financial resources, personal coaches and trainers can often get your child started in the right direction. And of course there are other resources including books, video instruction, and computer software that can provide guidance to a young athlete or parent.